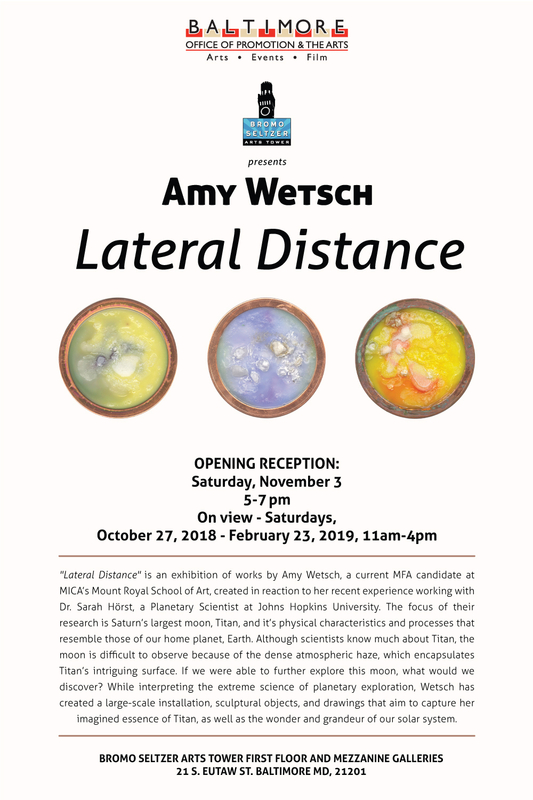 “Lateral Distance” is an exhibition of works by Amy Wetsch, a current MFA candidate at MICA’s Mount Royal School of Art, created in reaction to her recent experience working with Dr. Sarah Hörst, a Planetary Scientist at Johns Hopkins University. The focus of their research is Saturn’s largest moon, Titan, and its physical characteristics and processes that resemble those of our home planet, Earth. Although scientists know much about Titan, the moon is difficult to observe because of the dense atmospheric haze, which encapsulates Titan’s intriguing surface. If we were able to further explore this moon, what would we discover? While interpreting the extreme science of planetary exploration, Wetsch has created a large-scale installation, sculptural objects, and drawings that aim to capture her imagined essence of Titan, as well as the wonder and grandeur of our solar system.